I am having my second morning coffee in the LAOCAS hospitality lounge and a man walks in and announces loudly, "I am officially blown away!" Everyone looks. Ok? So what did you hear? He stands there grinning. 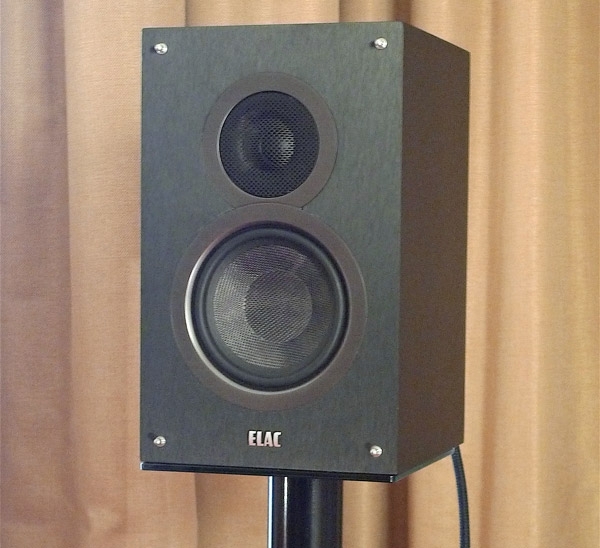 "Have you been to the Elac room?" Resolving to get an early start, I skipped breakfast and hit the show floor at 10:30am on Sunday. 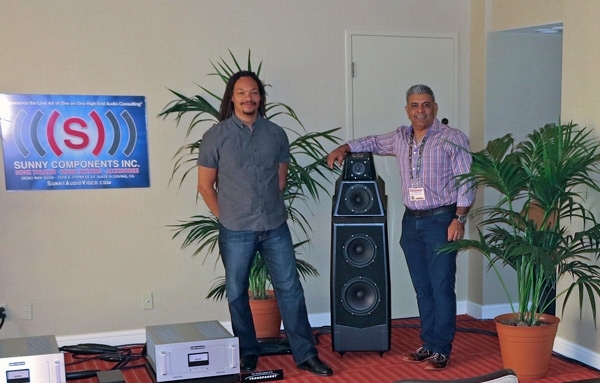 Will Kline of Fine Sounds (left) and Sunil Merchant (right) of Covina, CA's Sunny's Components were justifiably proud of the simply beautiful midrange created by the marriage of Wilson Audio Alexia loudspeakers ($52,000/pair) and Audio Research components. This wasn't the most transparent of systems I auditioned, but it was unquestionably among the most musical. 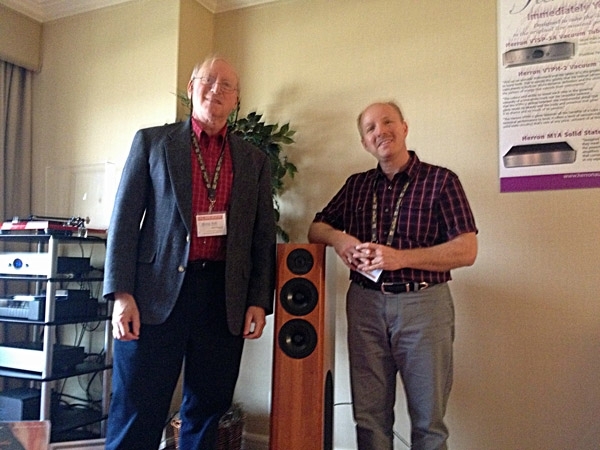 My beat for Stereophileto attempt to share with you my brief take on equipment and systems that might be described as "Medium Budget"; not too cheap, not too priceyjust right! A daunting task, given the sheer amount of fine gear here that could fit into that budget ballpark. 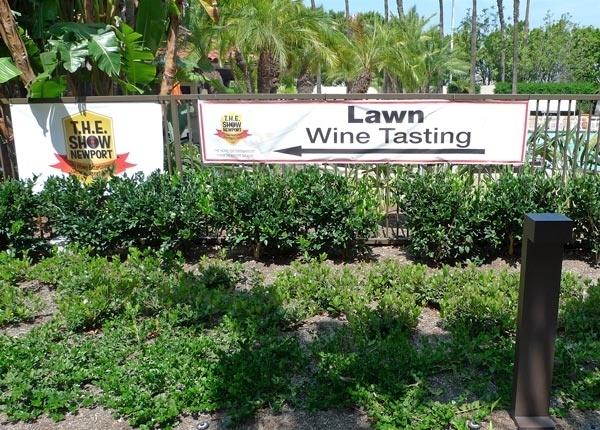 My first stop was late in the afternoon of the Thursday Press Day. 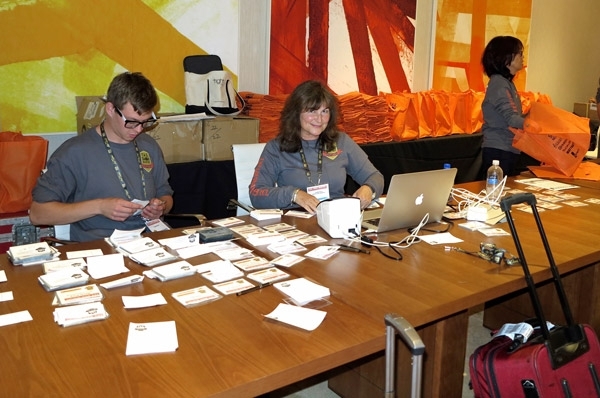 I sought out familiar friendly faces in the Positive Feedback Online Hospitality Room. 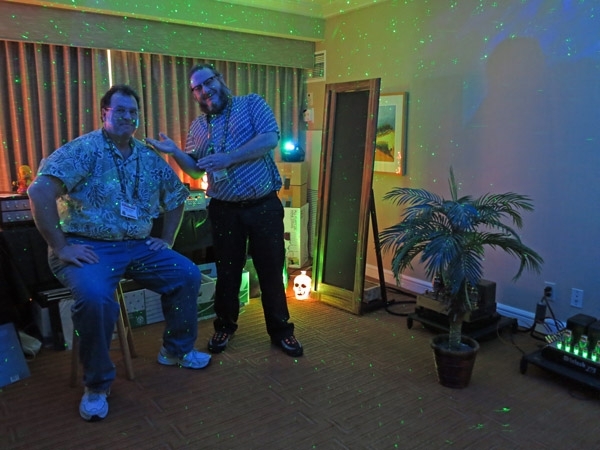 (Here is a photo of Positive Feedback editors David Robinson, right, and Dave Clark, left.) This is fast becoming sort of the audio equivalent of the Grateful Dead's long strange trip. 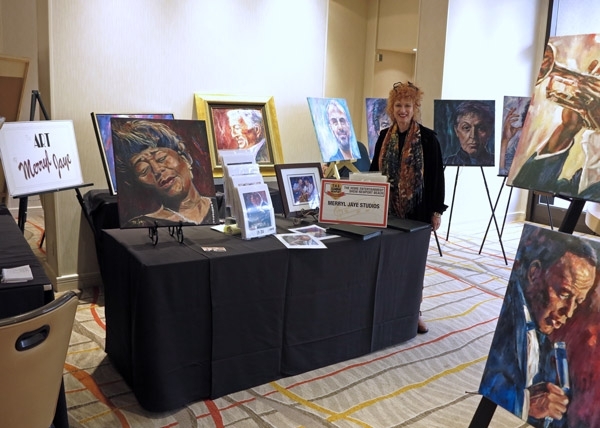 My very full second day at THE Show Newport continued with some wonderful quality time and listening. 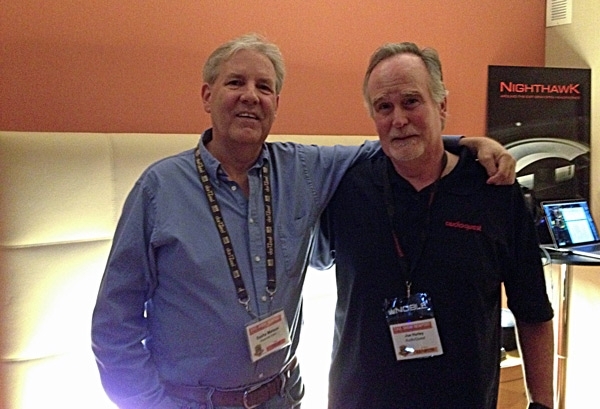 Had a good visit with designer/owner Keith Herron (left), of appropriately named Herron Audio. 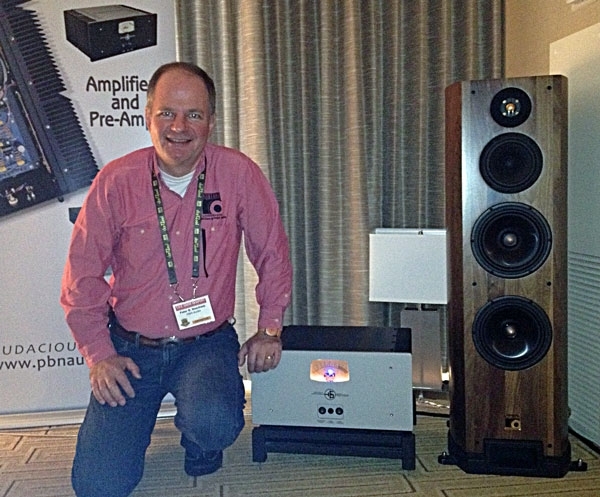 This company is based in St. Louis, and Mr. Herron is particularly interested in the musical aspects of his gear, and stated to me that he felt musicians respond particularly well to it. Being a composer myself, I think he is spot-on. The ribbon had been cut and the trumpets sounded. 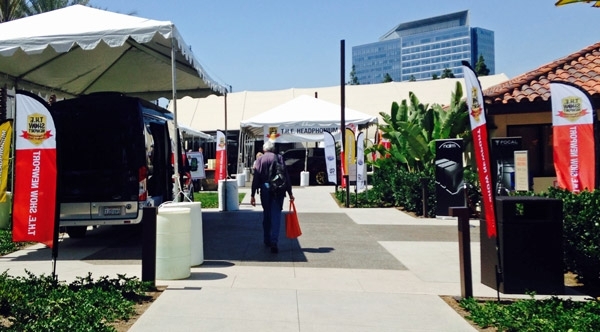 THE Show Newport Beach, whose 2015 installment had moved a mile or two up the road into Irvine, was underway. 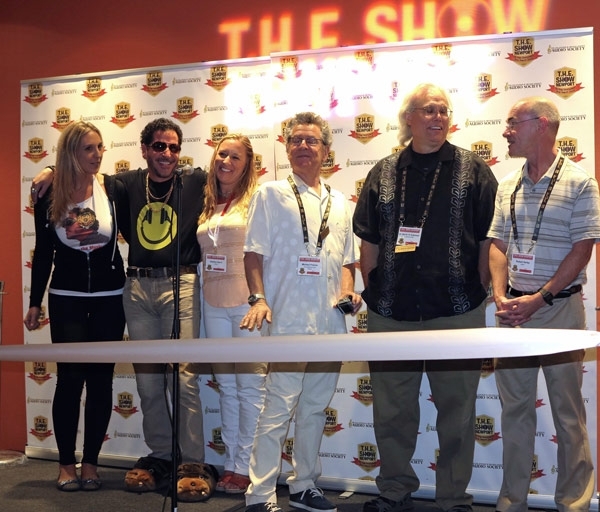 Doing the honors at the ribbon-cutting ceremony were, from left to right, a gold chain-bedecked Steve Rochlin of Enjoy the Music, accompanied by his wife, Heather to his left, and an unidentified woman to his right; Michael Fremer of Stereophile and AnalogPlanet.com; David Robinson of Positive Feedback, Robert Harley of The Absolute Sound. 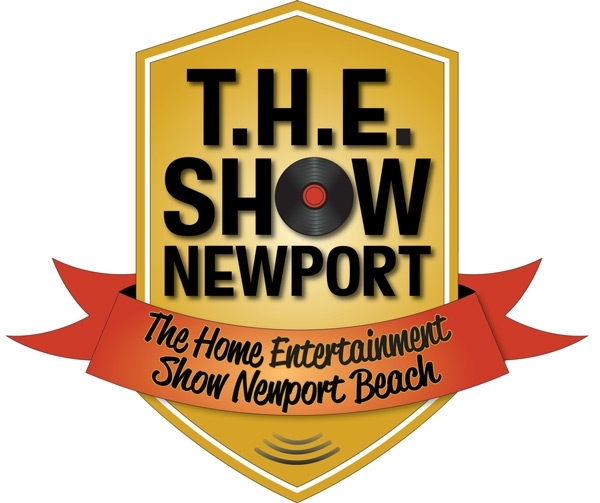 Six weeks before the start of THE Show Newport Beach, word got out that the show organizers were poised to add a last-minute "Trade and Press Day" for Thursday May 28. As it turned out, the actual announcement came later, less than a month before the show. The idea, if instituted correctly, could have been a good one. But done so last minute, it seemed, at best, half-cocked...Be that as it may, I was able to register with the lovely Lucette Nicoll (above center) and take in just a few rooms before dinnertime. 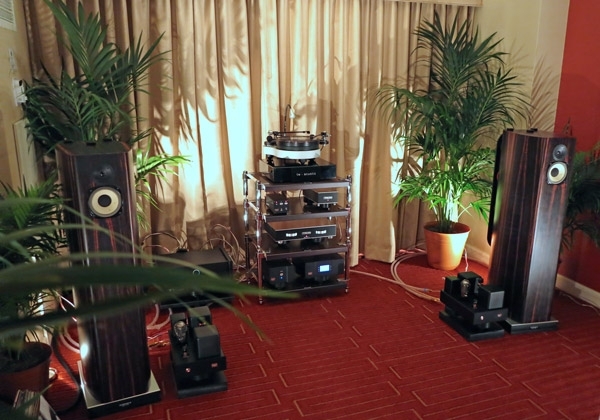 During THE Show, the Woo Audio/MA Recordings room became my restful oasis. 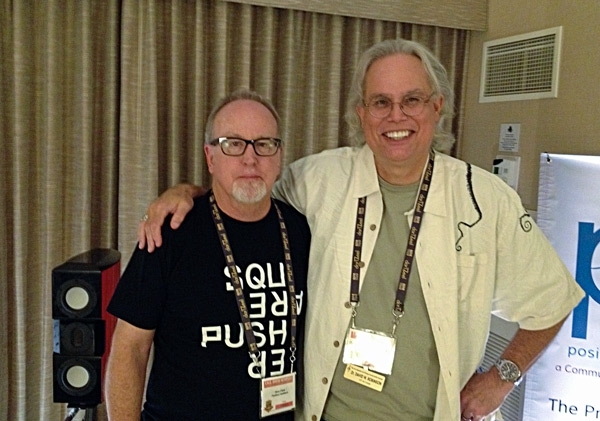 I am an extreme fan of MA Recordings and its most worldly proprietor, Todd Garfinkle (right above in Jason's photo). Todd makes perfect-sounding recordings of real in-the-world music. Not audiophile recordings of some faux chanteuse in clown makeup singing songs she doesn't understand for an audience that cares more about sonics than poetic expression. In contrast, Todd Garfinkle picks up gypsies in the Paris Metro and brings them home. He shares his best food and wine with themand finally, when they are properly "prepared," he turns on his recorder and gets them to chant, shout and play wedding songswith tubas, clarinets, trumpets, trombones, accordions, drums and fierce stomping boots!